We, the International League of Peoples’ Struggle (ILPS), call on the Myanmar government to respect the Rohingya people´s right to self-deetermination and end their oppression. We strongly condemn the continuing persecution, genocide, ethnic cleansing and escalating military offensives against the Rohingya people in the Rakhine State of Myanmar. Since August last year, more than 668,000 Rohingya have fled Myanmar for camps over the Bangladeshi border. This has swelled the number of refugees to 800,000 aside from the estimated 100,000 internally displaced persons in camps inside Myanmar. Others have fled to other countries even as ASEAN states continue to refuse them entry into their borders. The world continues to watch in horror as thousands of Rohingyas are left to die, without proper food, shelter and protection. Majority are children. Migrant detention camps and mass graves have been reported along the Thailand-Malaysia border. The Rohingyas have long faced systematic military repression under the social-fascist (socialist in words, fascist in deeds) dictatorship of Ne Win (1962-88) and again after the 1988 uprising with repeated military crackdowns in 1991–1992, 2012, 2015 and 2016–2017. Over the past 50 years, Burma’s military rulers have enabled state and large corporations to take over land and water supplies in what used to territory of the ancient Kingdom of Arakan before it was incorporated into Burma under British colonial rule. They have facilitated the expansion of mining, oil, natural gas, timber and agricultural plantations in these areas, displacing ethnic minorities such as the Rohingya, Karen, Mon and Shan in the process. They have even facilitated the entry and operations of Chinese, Korean, Japanese and other monopoly capitalist investors. The current government of Myanmar headed by Aung San Suu Kyi and her National League for Democracy (NLD) ascended into power after a decades-long struggle against the nation’s military that ruled Burma since 1962. Suu Kyi and those occupying top positions within her government are also the product of decades of US-UK and European backing, training, and indoctrination. Now in power, they represent US and European monopoly capitalist interests that continue to provide them with tens of millions of dollars in US, British, and European aid in exchange for the far greater superprofits exacted by the foreign monopoly firms.. Entire networks of fronts posing as nongovernmental organizations (NGOs) have also been created and funded by the US National Endowment for Democracy to undermine andand sabotage] Myanmar’s sovereign institutions. But despite putative “democratic” reforms, the military retain enormous power over Myanmar society at present. Suu Kyi’s government does not recognize the 1.3 million Rohingya people as an ethnic minority They are severely persecuted and denied basic rights, including the freedom o belief and freedom of movement, state education and civil service jobs. Myanmar’s armed forces and police started their latest crackdown on the Rohingya people in Rakhine State in August of last year ostensibly in response to attacks perpetrated by the Arakan Rohingya Solidarity Army (ARSA), a newly formed militant Islamic group, alleged to have ties with Saudi Arabia. 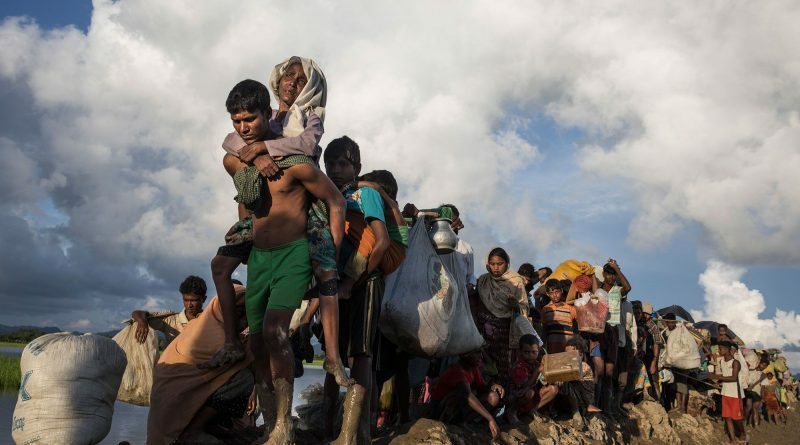 The Myanmar military have since been carried away by Buddhist chauvinism and perpetrated wide-scale human rights violations, including extrajudicial killings, gang rapes, arson and infanticides. Right-wing ultra-nationalists, including Buddhist religious leaders and supporters of Suu Kyi and the NLD, have also increased incitement of hatred and religious intolerance. US and other Western imperialist powers have blamed “some among the Burmese military, security forces, and local vigilantes” for the genocidal rampage, while calling on Suu Kyi to play a more constructive role to resolve the crisis. They are mindful that Myanmar might turn towards China for support, noting that the Rakhine state is an important node in China’s One Belt One Road blueprint – connecting Sittwe Port located there to infrastructure that crosses Myanmar to China’s southern city of Kunming. Indeed, the violence in Rakhine state potentially threatens Chinese interests. More importantly, it can provide a pretext for direct US military involvement – either in the form of “counter-terror assistance” as is being offered to the Philippines to fight US-Saudi-backed militants from the Islamic State, or in the form of a “humanitarian intervention.” In either case, the result will be US military assets placed in territory directly on China’s border just as US war planners have sought to do for decades. Meanwhile, with its growing clout in Burma, China has deferred to Myanmar and kept silent on the human catastrophe. The United Nations and the European Union are providing token assistance, but not nearly comparable to resources dedicated to addressing the refugee crisis in Europe that has resulted from the US-led wars of aggression in Afghanistan, Iraq, Libya and Syria. Neither SAARC (South Asian Association for Regional Cooperation) nor the ASEAN (Association of Southeast Asian Nations), two regional intergovernmental organizations, has stepped up to help mediate a diplomatic or even humanitarian solution. Even with voluntary repatriation, no real progress has been made in solving the larger economic, social, and political problems facing the Rohingya people.